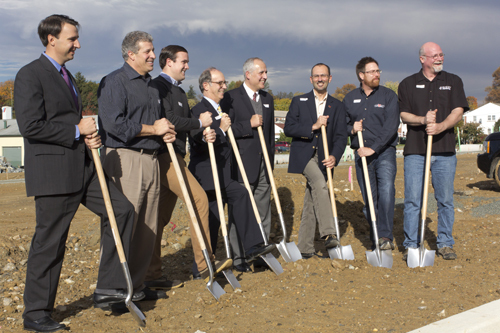 County Commissioner Ryan Costello, Mike Pia, Sr. and Mike Pia, Jr. of Kennett Square Realty, State Representative Chris Ross, Senator Dominic Pileggi, Borough Councilman Dan Maffei, Bill Covaleski and Ron Barchet of Victory Brewing Company break ground on Victory’s new brewpub in Kennett Square, PA.
DOWNINGTOWN, PA—On Friday, November 1, local businesses, township leaders, and government officials joined Victory Brewing Company and members of the Kennett Realty Group to celebrate the official ground breaking of a new Victory brewpub, Victory at Magnolia, located at the corner of Cypress and Mill Streets in Kennett Square, Pa.
Set to open in the second quarter of 2014, the planned 250-seat restaurant with space for outdoor dining will occupy all 8,138 square feet of the bottom floor of a four-story, luxury apartment building in Kennett Realty Group’s latest upscale residential community, Magnolia Place. Kennett Realty is owned and operated by the Pia Group, who also own Kaolin Mushroom Farms Inc. and South Mill Mushroom Sales. The event was abuzz with excited community members anxiously awaiting the new development and economic boost the town is likely to experience as a result. “We’ve received an awesome welcome from this great community and its leaders, and we couldn’t be more excited to bring the world-class Victory experience to Kennett Square,” said Matt Kruger, Vice President of Retail Operations. This will be the second brewpub for brewery, which first opened the doors at its Downingtown location in 1996 and has enjoyed a reputation as a family-friendly, casual dining establishment since. Recently, Victory’s brewpub was recognized by the Pennsylvania Restaurant & Lodging Association for its leadership, service and commitment to exceeding the standards of excellence in food safety and sanitation. Visit www.victorybeer.com/news/kennett-groundbreaking to view more photos from the groundbreaking. Victory Brewing Company is a privately held craft brewery headquartered in Downingtown, Pennsylvania. Begun by Bill Covaleski and Ron Barchet, childhood friends who met on a school bus in 1973, the brewery formally began operations in February of 1996. Victory, Pennsylvania’s widely acclaimed brewery and restaurant, now serves fans of fully flavored beers in 31 states with innovative beers melding European ingredients and technology with American creativity. To learn more about Victory Brewing Company visit us on the web at www.victorybeer.com. Kennett Square Realty is a second generation Real Estate Acquisition, Development, and Management Company. The Chester County-based firm is managed by Vice President Mike Pia, Jr. Kennett Square Realty’s development is focused on infill projects in communities with vibrant downtown’s throughout Chester County. Magnolia Place is a 81 Unit Mixed-Use Townhouse and Apartment development located in the Borough of Kennett Square.